As a clinical leader, you know the challenges all too well: Staffing shortages. The need to blend operational efficiency with clinical quality. 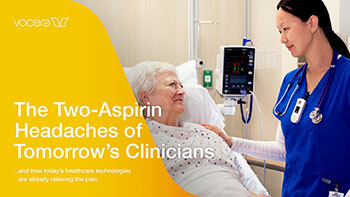 The drive to deliver an exceptional patient experience. The quest to influence physicians to adopt new technologies and protocols. Today’s challenges could be tomorrow’s as well. But as healthcare providers transform into real-time health systems, we see a good prognosis for those who improve clinical communications and workflow with technologies already in place today. For more information about Vocera solutions to support your institution's Clinical Communication strategy, click to complete the form or call 888-9VOCERA to get in touch with a Vocera sales representative. © Copyright 2017 Vocera Communications, Inc. All Right Reserved.